Country Blacksmith Trailers has over 30 tilt trailers for sale in Southern Illinois! 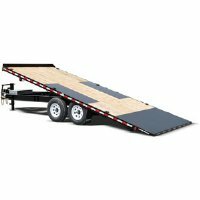 Shop our wide variety of tilt decks ranging from single axle tilt trailers to dual tandem gooseneck tilt trailers. If you have any questions or can’t find the right trailer, give us a call or visit our Mount Vernon or Carverville Illinois stores to talk to a specialist today.